Photo above: Gov.-elect Larry Hogan names Craig Williams as chief of staff and Sen. Joe Getty as legislative director. Joe Getty, the Republican senator from Carroll County, went to the State Board of Elections a few blocks from the State House last Jan. 16, and filed for reelection. By the next day, the board posted the notice of his filing on the Internet for all the World Wide Web to see. His Democratic opponent, Anita Riley, made a similar trek, filing on Feb. 24. It was posted the same day. Over the next months, the two candidates would file six campaign finance reports, also posted online, telling who was supporting them financially. In June, even though both were unopposed in the primary, 12,484 Republicans would vote for Getty, and 4,471 Democrats would cast ballots for Riley. In November, in this district designed to pack Republicans in, Getty would win in a landslide, getting 78% of the vote, with 37,406 people voting for him, and 10,203 for Riley. 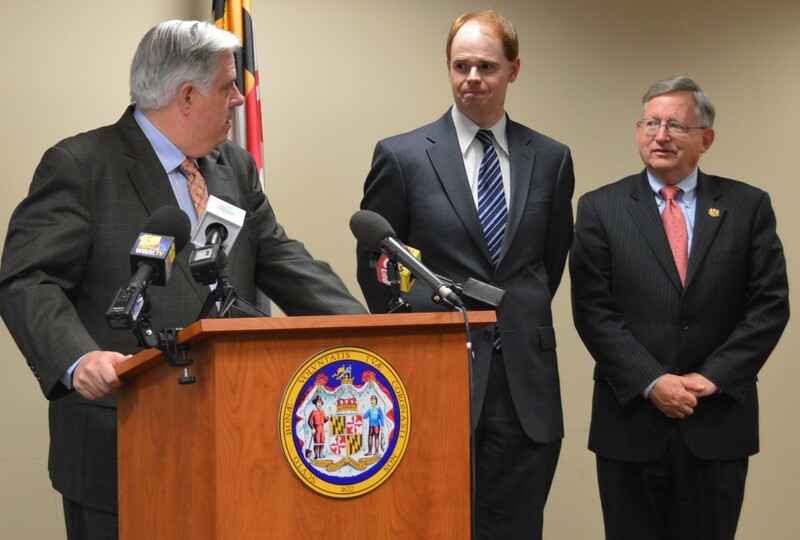 Gov.-elect Larry Hogan has now named Getty as his legislative and policy director. Getty will resign, and as directed by the state constitution, the nine members of the Republican Central Committee from Carroll County will get to nominate his successor, and the governor typically appoints the person recommended. None of the openness, transparency and public participation that characterized Getty’s election now apply. Who is running for Getty’s seat? The Carroll Central Committee won’t release the names. It posted this notice on its website. Don’t call us — we’ll call you. Nine people, elected in the June Republican primary, will get to choose a replacement for a state senator who represents 128,000 people and was elected by 37,000 voters. That person will serve the rest of Getty’s four year term, with all its pay, benefits and power. A similar but slightly more open process is under way to replace Del. Kelly Schulz of Frederick County, named by Hogan to be secretary of Labor, Licensing and Regulation. Since District 4 includes a slice of Carroll County, the Republican Central Committee there is also involved in the process. The Frederick GOP committee released the names of the nominees, but it chose to interview only three of them. There the process is being controlled by Sen.-elect Mike Hough’s faction of the party. His wife, JoeyLynn Hough, is the chair of the central committee. A delegate candidate who ran and lost on Hough’s ticket, Barrie Ciliberti, will get interviewed; Wendi Peters will not be interviewed. She got 600 more votes than Ciliberti as a losing delegate candidate who ran with Schulz and Sen. David Brinkley, whom Hough defeated in the primary. In Anne Arundel County, the Republican Central Committee will get to nominate a replacement for Del. Cathy Vitale, who was named a Circuit Court judge by Gov. Martin O’Malley. In all these cases, the local committees pretty much make up the rules for the process as they go along. The Maryland Constitution spells out their responsibilities, but it doesn’t detail the process for choosing the replacements. Maryland’s Open Meetings Act and its Public Information Act do not apply. It is the epitome of backroom deal making, and the three legislators just happen to be Republicans. The same closed partisan process applies to Democratic vacancies as well. It allows a handful of partisan representatives to choose legislators who sometimes serve for four years, with all the perks of office. Maryland has a strong aversion to special elections to fill any kind of vacancy in elected office. Only a few counties permit it for vacancies on their councils. It is understandable to have a process for a quick appointment to fill a vacancy for a 90-day General Assembly session, but why is there no special election to follow? Maryland only conducts special elections for vacancies in one major office — U.S. House of Representatives. That’s because the U.S. Constitution has required it for 225 years. At a League of Women Voters luncheon in Ellicott City on Saturday, Ken Stevens, a longtime good government advocate, suggested Maryland at least hold elections for vacant seats that occur early in a legislative term at the next presidential election. A couple of delegates thought that was a good idea; it was a reform passed for vacancies on the Howard County school board. Special elections conducted by mail, as permitted for vacancies on the Montgomery County Council, are an even better idea. At the very least, the General Assembly ought to force the party central committees to conduct an open process of applications, with all candidates given the option for public interviews. And if the party central committees are going to operate under the pretense that they are elected officials — even if chosen only by voters in their own party — they ought to be made to comply with the Open Meetings Act and the Public Information Act to bring some sunshine into the backroom dealings that go on.